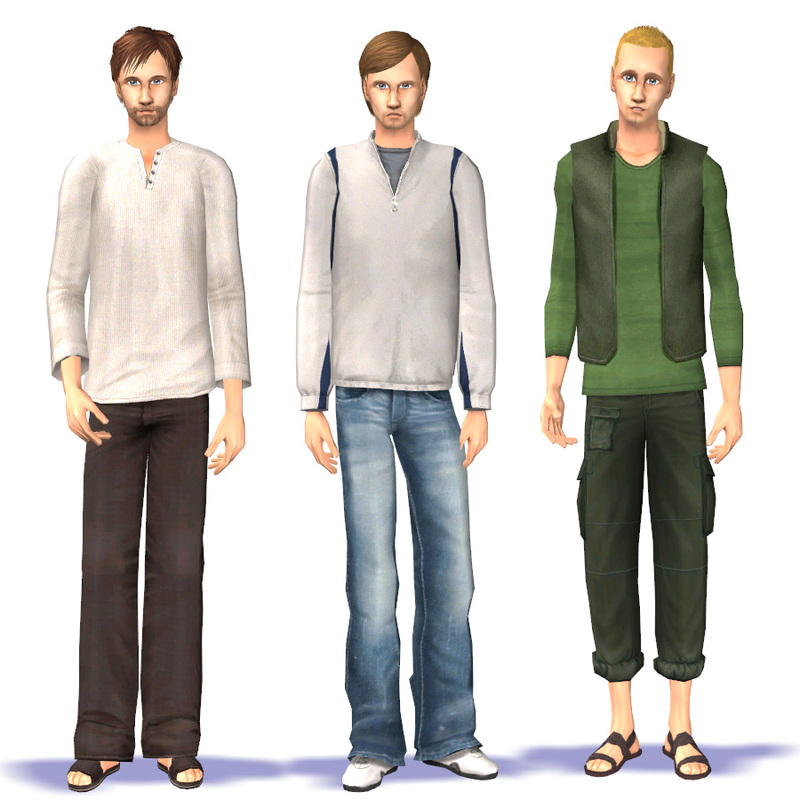 Here are 3 outfits that I made for 3 specific sims. Each comes in just one colour option. Benji Outfit (left): Is a white thermal henley worn with brown pants and sandals. Can only be worn as everyday wear, by adults and young adults. This outfit requires the University expansion because it uses a mesh that came with that EP. 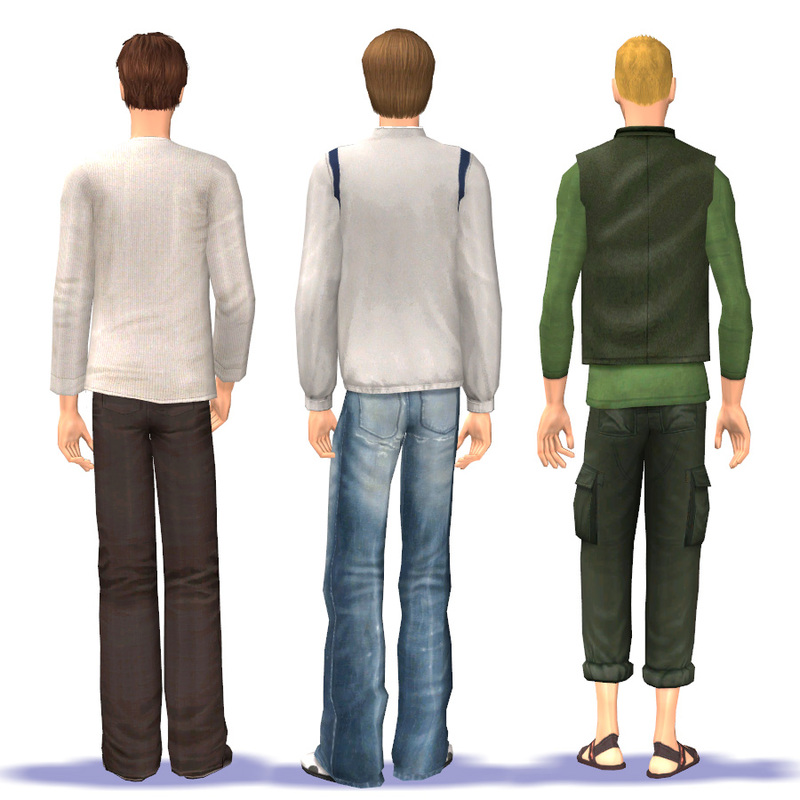 If you'd like a nearly identical top paired with jeans and sneakers, I've got one available at modthesims. 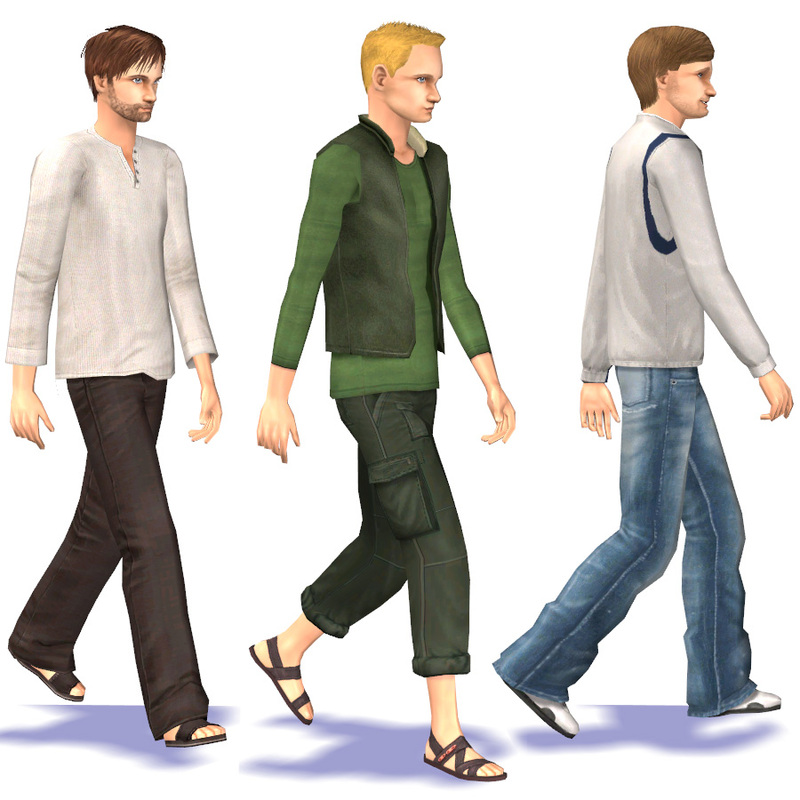 Derek Pullover Outift (middle): Is a dowdy daddish grey pullover worn with baggy jeans and sneakers. Can be used as everyday and athletic wear, by adults and young adults. The mesh is included and has a fat morph but no pregnancy morph. It's 2296 polys and was originally posted by me on modthesims along with 9 other colours. Meekus Outift (right): Is a green vest over a green shirt worn with rolled-up green cargo pants and sandals. Can be used by adults and young adults as everyday, athletic, and outerwear.... which, err, may not make lots of sense for every sim but it makes sense for my Meekus so sorry 'bout that if it's not what you want. This uses a new mesh with fat and pregnant morphs. The mesh is far from perfect, but it's good enough for me during normal gameplay so maybe someone else will like it too. Poly count is 2332. Again, I always say this, but one can never have enough clothing for the guys. Thank you! All three are really great, fansee. Thank you for putting these together and sharing them! Fansee, thank you so much.